Randy Olson has been named 2017 Plumbing Engineer of the Year by PM Engineer magazine. The award acknowledges Randy’s deep knowledge of products, design practices, and respect from industry peers. 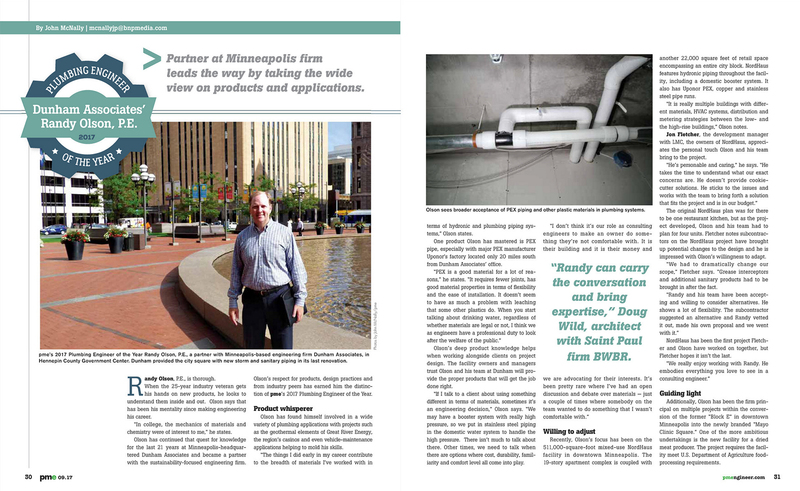 The announcement is featured in the September issue of PME and highlights his commitment to sustainability and his extensive product knowledge. The article also spotlights specific project applications and provides insights from a few colleagues and coworkers. Randy joined Dunham in 1996 and is a Partner in the firm. He holds a degree in Mechanical Engineering from Minnesota State University, Mankato.